Trot Nixon and the Red Sox have taken a liking to being referred to as "Dirt Dogs," a term in baseball that refers to a scrappy, grind-it-out kind of team or player. Nixon has printed up T-shirts for his fellow "Dogs," and is giving Paul Quantrill of the Blue Jays credit for anointing them as such. With apologies to Quantrill, Nixon needs to watch more Baseball Tonight. I've had an All-Dirt-Dog team for years, and have mentioned several times how the Red Sox are a bunch of "dirt dogs" who keep fighting no matter how bad things get. Nixon, Chris Stynes, Brian Daubach, Mike Lansing, Shea Hillenbrand and Jason Varitek are a group of non-superstars who've fought and clawed their way through this season with terrific results. Truth is, Quantrill probably heard the term on Baseball Tonight in the first place! However, neither I nor the show deserves credit for the moniker -- like all great baseball-speak, it's been around for quite some time! ...the above is too funny from my perspective. I actually gave Trot about 20 shirts from my original first run back in July and have heard it referenced in the local media how he "had them printed up for the team"...hey, how about a plug for the unemployed guy from Brighton who did it on a whim? And I'm still waiting for Trot to leave me tickets for a game (just kidding Trot... but if you can spare one, I'm there, and will hold out for October tickets if you get my drift). The players actually just got another 70 shirts this week. And I'm also the one who gave Paul Quantrill credit for coming up with the "Dirt Dogs" term... I read it in the Globe, see his quote below, and obviously am not watching enough Baseball Tonight. Dave Campbell... my apologies. Sounds like you originated it for the masses long before Quantrill, Buck Martinez, and most certainly me. 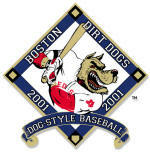 I just love dogs, this year's version of the Sox, and thought it was a natural theme to build upon. 2.28.02 What's a Dirt Dog? "Some guys in this game are so talented and gifted, the game comes so easy to them, they take it for granted. They get handed their jobs or roles or the ball with no questions asked... Nobody's put above anybody else. This is a big part of what makes a championship team." "I'd rather have Dirt Dogs than a gifted guy not giving 100 percent. I believe it's because they didn't learn to grind, to battle through adversity. These are guys who will keep competing and not hit the wall and give up."